NEW YORK (AP) Mets general manager Sandy Alderson anticipates a flurry of roster moves as a large number of players find teams in the next few weeks. J.D. Martinez, Eric Hosmer, Mike Moustakas, Jake Arrieta, Alex Cobb, Greg Holland and Lance Lynn remain among the dozens of unsigned players with the Feb. 14 start of spring training less than two weeks away. Alderson counted only 13 open spots on 40-man rosters, which will lead to players getting traded, designated for assignment and released. 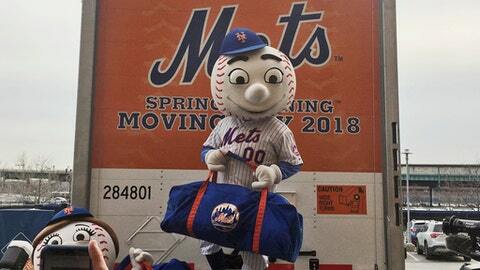 Alderson spoke with invited fans as the Mets’ equipment truck was loaded for the trip to training camp in Port St. Lucie, Florida. In a sign of baseball economics, club executives told him to speak with the media and face cameras while standing in front of the spot of the truck containing a sponsor logo. Moustakas is among the nine free agents who turned down $17.4 million qualifying offers from their former teams. A new club signing one of those players would incur penalties. With a slow free-agent market, teams appear to be more deliberate in their negotiations. Alderson said 44-year-old pitcher Bartolo Colon was not likely to return to the Mets, where he became a fan favorite from 2014-16. He was surprised when a fan asked him about pitcher Jenrry Mejia, given a lifetime suspension in February 2016 following his third failed test for performance-enhancing drugs.